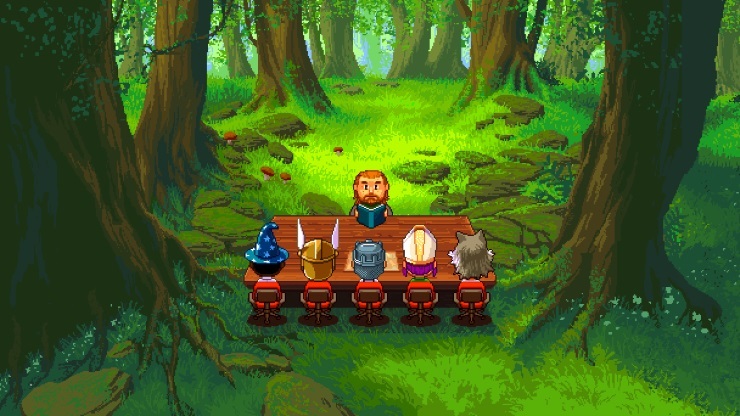 Knights of Pen & Paper 2 is centred around a pretty unique design concept: a table is always present in the middle of the screen, one seat on the far side and five on the side closest to the player. The Dungeon Master faces the screen at all times and narrates your quests, while your five adventurers have their backs turned as if they’re focused on the game at hand. The table never moves or changes, instead being a constant feature on-screen with only the environments which surround it changing as the party travels around the map to a various set of locations. Your role in-game is to help the inhabitants of Paperos (a nod to Game of Thrones fans) in a multitude of quests, varying from item collection to defending individuals from packs of monsters. Your guide through the 16-bit fantasy world is the Dungeon Master, who humorously explains scenarios and locations your party finds themselves in. There is plenty of wit and tongue-in-cheek jabs at the RPG genre in general – sort of like an inside joke between the developers and the gaming community in general. Controls are nothing more than point in click, with mechanics such as crafting, the shop and investigation tools being gradually introduced as you level up and add more players to your table. The possibility to customise character’s skills endlessly and make them a master in combat or adept in intelligence is fun, mostly because you can pick between preset archetypal RPG tropes, but it’s never too serious. 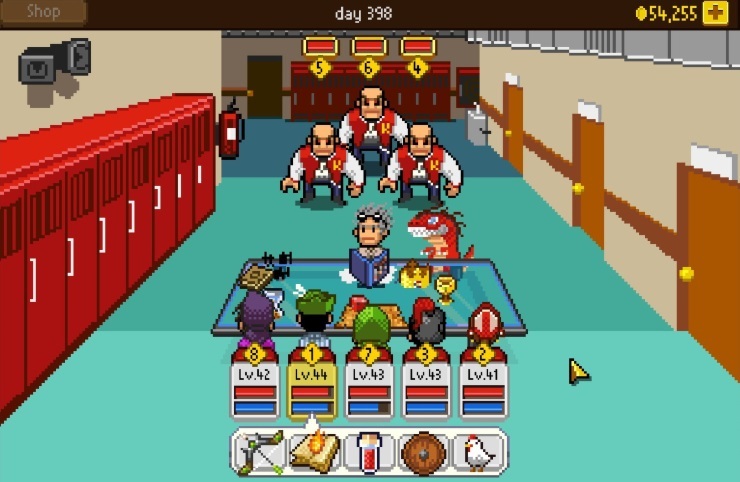 Each character type comes with it’s own unique set of attacks (either offensive or defensive), allowing for some players to advance with brute force while others sit on the bench and keep everyone in good health. This balance between offence and defence can be the key to winning especially when enemies increase in number and power, so experimenting with various types in your party can only benefit you. Virtually everything is decided by a dice roll, which is an idea that puts a lot of faith in sheer luck, but that’s a tabletop game for you. It never feels unfair, and in fact helps to keep the whole thing fresh: refraining from feeling too punishing but not crossing the line of being to generous. It constantly surprises with cultural references, and has plenty of other little nods to gaming history for the pleasure of long-time gamers aside from the Game of Thrones ones. The mobile version is been smooth and it works as well as the PC version, as adds a degree of portability. While it’s easy to be absorbed and spend hours playing in one sitting, I found that it’s just as easy to jump in and out when you’ve got a spare minute to get that quest finished or earn a few more coins for when you return. The only thing that’s difficult is trying to tear yourself away from it when you have real work to be doing. 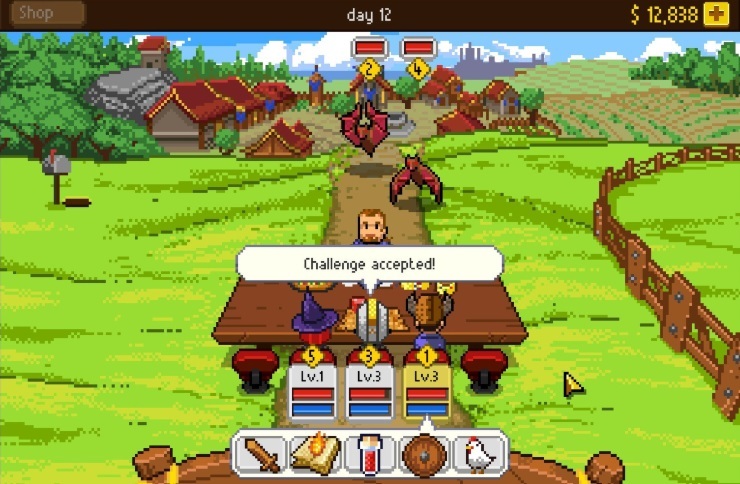 Paradox have succeeded once again with Knights of Pen & Paper 2, but I’m not surprised with their sparkling track record. Their creation is truly a hidden gem: a charming game with simple gameplay making it accessible to virtually everyone. Built around a unique concept with some lovely environments and gameplay mechanics, it’s not hard to fall in love and stay infatuated, knocking away the often daunting atmosphere of RPG titles and appealing to the masses with humour, quirkiness and charm. Knocks away the often daunting atmosphere of RPG titles and appeals to the masses with humour, quirkiness and charm.